Buffered by gently sloping hills and the San Pablo Bay, Bouchaine Vineyards inhabits a truly unique space in the Napa Valley. The southernmost region in the southernmost appellation of Napa, Bouchaine cultivates Chardonnay and Pinot Noir, crafting widely acclaimed wines that are nuanced, finely balanced and truly showcase the best characteristics of these famously fickle varietals. Get away from your getaway—leave the crowds behind, hike through our vineyards, and be our guest at Bouchaine. Bouchaine's long wine producing history is respected today as we apply green farming and sustainable practices to making interesting, layered wines with sensual delight. We follow three simple tenets: first, do no harm; second, be a good neighbor; and third, make the best, varietally correct, complex, and sophisticated Chardonnays and all things Pinot. Winemaker and General Manager Chris Kajani joined Bouchaine in early 2015 brinigng with her a decade of boots on the ground knowledge of Carneros soils and microclimates. Our wines beautifully embody the elusive goal of “blending with power and depth without sacrificing the ethereal perfume that is Pinot Noir”. We love sharing our wines, from guiding the wine novice in their journey of discovery, to sharing with the wine connoisseur in the pursuit of enjoyment. For us, it's the same as opening our home to the most esteemed guests, sharing the fruits of our labor and the story of the vineyards, the harvest, and the art and science of winemaking. View from Tasting Room: Southern Napa Valley and Carneros rolling hills planted to vineyards, mountains in distance. 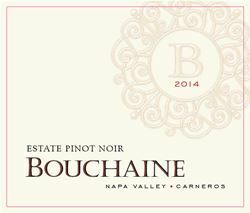 To join the wine club, visit www.bouchaine.com or call 707-252-9065. The Bouchaine Bacchus Wine Club sends four shipments per year of winery only wines, with pick up party events open to club members only. Club members are invited to enjoy their tastings outside on our exclusive club member redwood deck overlooking our estate vineyard. Membership includes a discount on most wines. Bouchaine Vineyards is certified under the Napa Green Winery Program by the Napa County Department of Environmental Management (DEM) and the Association of Bay Area Government’s (ABAG) Green Business Program and completed all the regulatory components needed for environmental sustainability. These components included developing water and energy conservation methods, preventing pollution, and reducing solid waste. In addition to developing sustainable winery practices, this program is set to become the standard for the state of California. Bouchaine Vineyards is certified under the Napa Green Certified Land Program. Bouchaine Vineyards has created and implemented a customized farm plan with measured results that addressed all aspects of its property, vineyard land as well as non-farmed land, including practicing soil conservation, water conservation, stable drainage, riparian corridor enhancement, fisheries and wildlife habitat enhancement and long-term improvement and sustainability.